Nintendo has posted an overview trailer for the end-of-July release, Hey! Pikmin. Showcasing all of the different types of gameplay and features within this Nintendo 3DS game, Hey! Pikmin looks like a nice and fresh take on the Pikmin franchise in a familiar 2D form. A second review will be posted later in the evening, but for now let's put our collective focus at Mighty Gunvolt Burst, the latest from developer Inti Creates, known for the Mega Man Zero series of games. Mighty No. 9 was a mess, but can Beck ride of Gunvolt's coattails to salvage his own gaming career? The whole sordid saga with Mighty No. 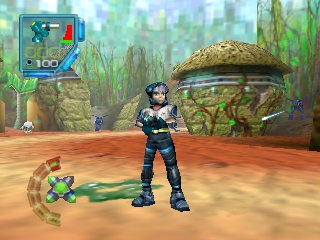 9 and its Kickstarter really soured and disappointed a huge legion of fans who were promised something great from Keiji Inafune, a designer partly behind the creation of Mega Man. Instead, Mighty No. 9 ended up being delayed multiple times, the marketing was out of touch at best, the campaign was poorly managed, and the end game was average at best. 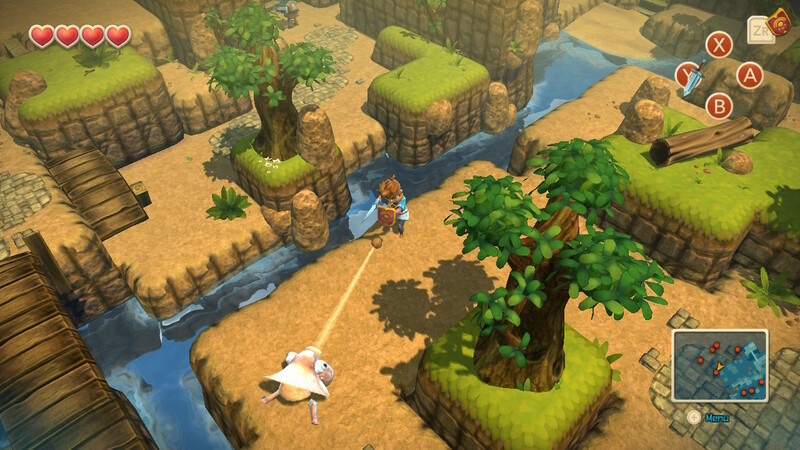 However, the development team at Inti Creates worked on a smaller game in preparation for the release of Mighty No. 9 in the meantime, a Nintendo 3DS eShop and Steam release known as Mighty Gunvolt. 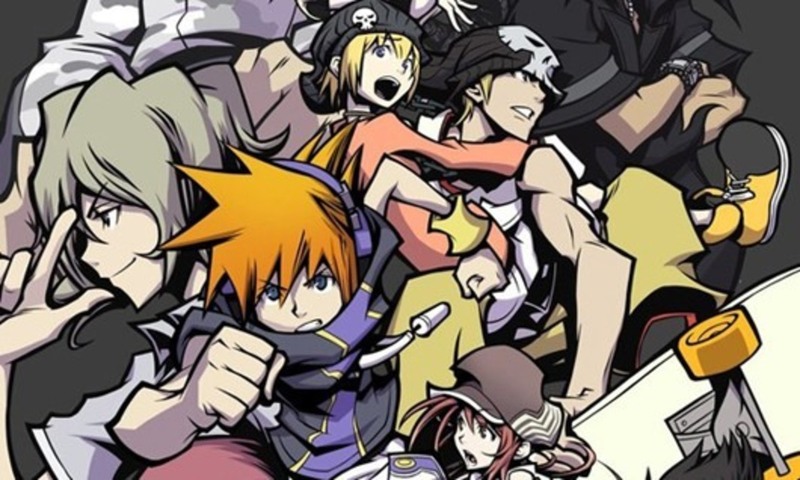 This game combined the styles of Inti Creates' own IP, Azure Striker Gunvolt, with Mighty No. 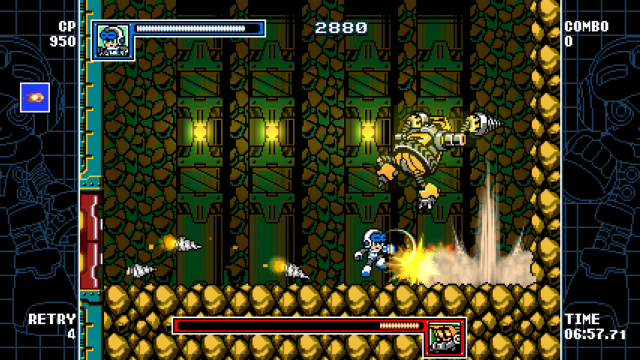 9, creating its own unique Mega Man-styled mashup. Now, we see a sequel, exclusive to Nintendo Switch and soon Nintendo 3DS with Mighty Gunvolt Burst. The irony here is that for all the millions of dollars backed into Mighty No. 9, this budget project in Mighty Gunvolt Burst is clearly the superior product in this reviewer's eyes. 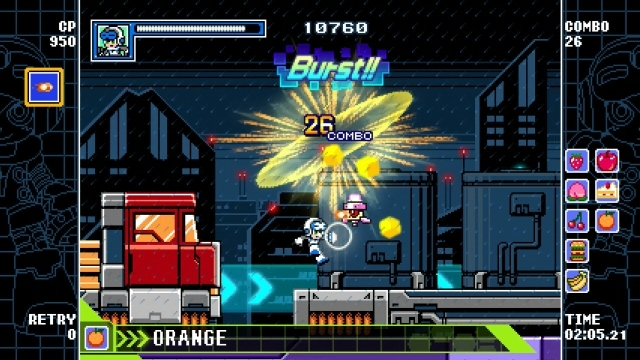 Mighty Gunvolt Burst allows you the choice between playing as Mighty No. 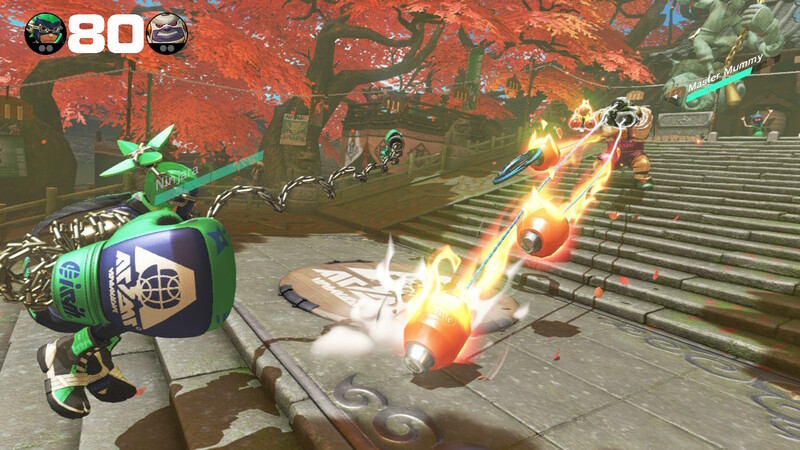 9's Beck or Azure Striker Gunvolt's Gunvolt, each with slight gameplay differences that grow as you acquire new customization parts. More on those later. 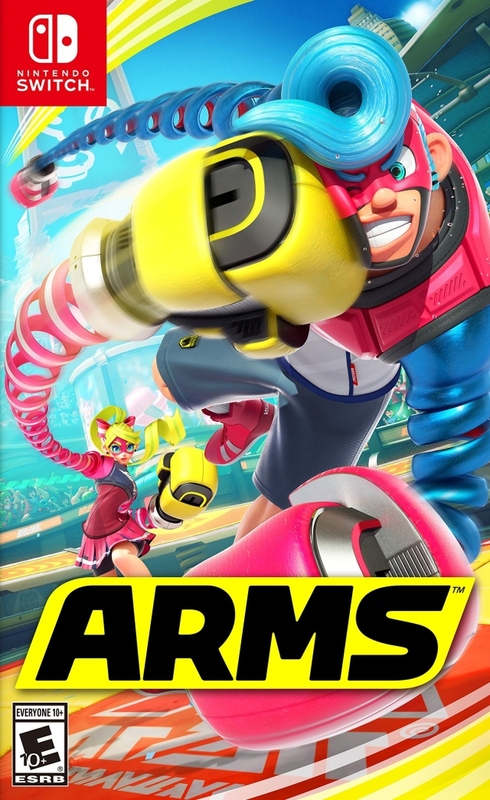 The game is set up like a traditional Mega Man game complete with a tutorial intro stage, eight "Robot Master" stages that can be chosen from in any order, and a trio of final levels that ramp up the difficulty and feature some cool level gimmicks. 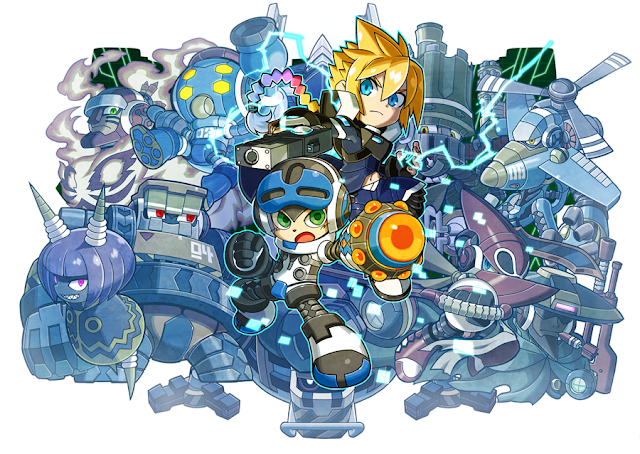 The "Robot Masters" of Mega Man in Mighty Gunvolt Burst come in the form of the "Mighty Numbers." 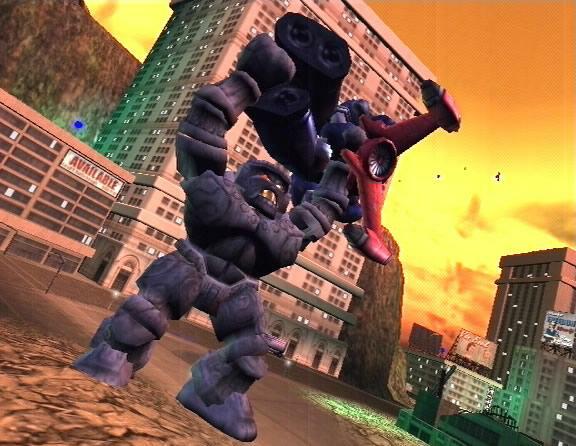 They are all the same eight bosses from Mighty No. 9 but with new attack patterns that change as their health edges closer to being fully depleted. 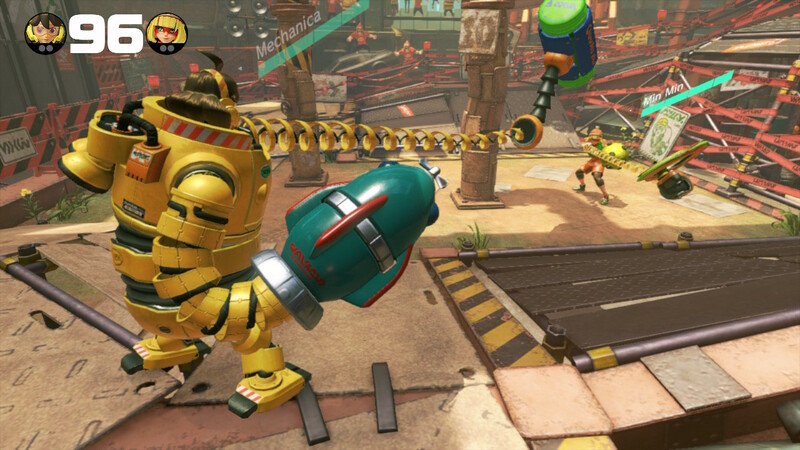 Bosses are generally tough to crack at first because they possess so much health, which is a bit draining, but being able to acquire fruit that serves as health refills makes fights easier to adjust to. 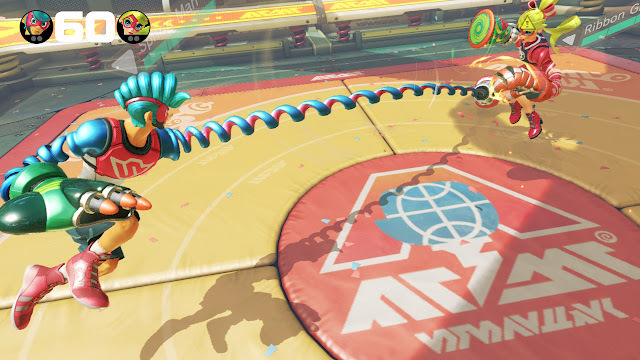 You can learn their moves, when to dodge, when to attack, and even if you die after using all of your collection of fruit, they return to you based on the fruit you had at gate before the boss. Beck shows Seismic here that size doesn't really matter. 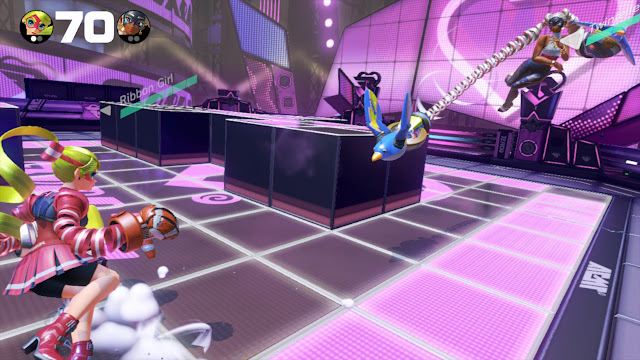 Stages are themed similar to those in Mighty No. 9, save for the final levels which go in a totally different direction. 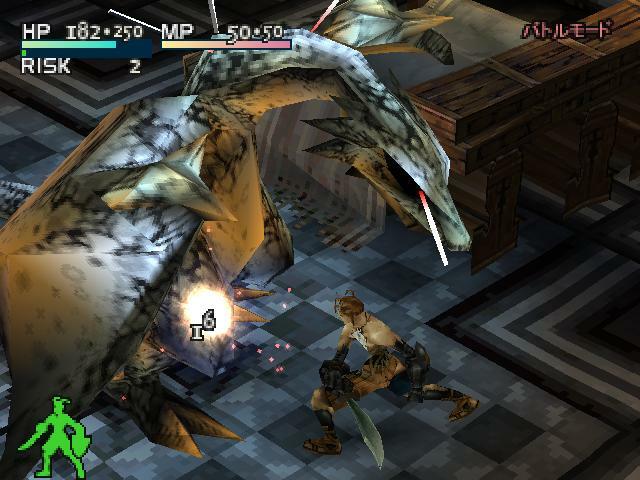 Places like Countershade's museum stage has a familiar museum with equally familiar enemy types to Mighty No. 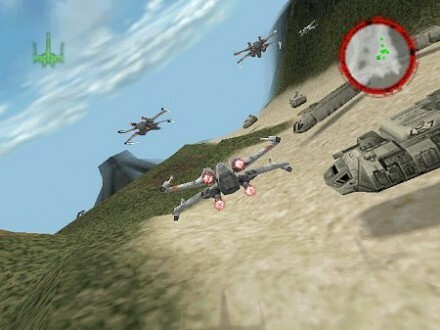 9 vets, but the layout, obstacles, and setup are all different. No need to annoyingly chase Countershade through multiple looping hallways where one death means you have to begin the pursuit all over again. 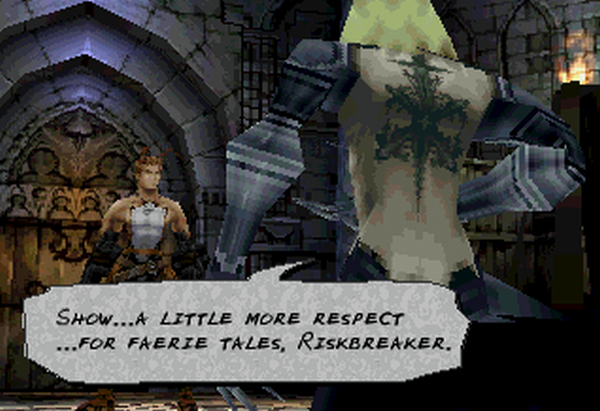 Instead, you just have to follow one of three paths to unlock security panels leading to the encounter with Countershade. The level design in Mighty Gunvolt Burst is more like a standard Mega Man game rather than the obnoxious designs of Mighty No. 9. There are quite a few Azure Striker Gunvolt elements in the level design as well, which makes total sense, of course, due to the material, after all. The levels in Mighty Gunvolt Burst are a blast to play through, and that's exceptional due to the optional ability to replay them. If you're a completionist or just want to get the most out of your purchase, then you'll most likely want to do so, as the rewards are beneficial. Each stage houses multiple secret chips that unlock abilities for either Beck or Gunvolt. 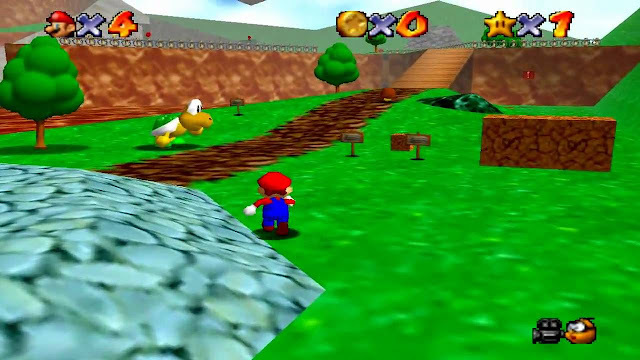 Some are out in plain sight, but in difficult to access locations, while others are housed behind destructible walls that have no clear appearance that they can be destroyed. Thankfully, one of the abilities available to Beck and Gunvolt is one called "dowsing", which causes a rumble in the Nintendo Switch controller that gets more forceful as you near the wall in question. Outside of chips to collect (some are only available through multiple completions of a stage), there are 20+ challenges to complete, offering rewards for finishing them off. 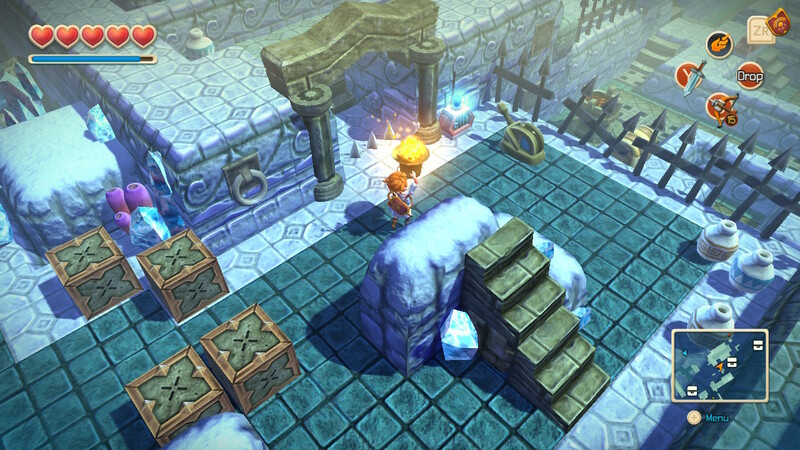 The gift of HD rumble brings the gift of finding a secret area. It's great you can get chips, but what do you do with them exactly, you ask? 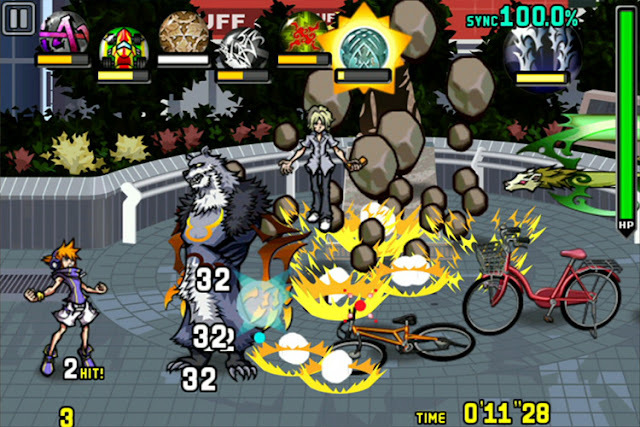 You can create load-outs for Beck or Gunvolt that alters an exhaustive and ever-growing list of abilities. By consuming CP (which I assume means Command Points), you can equip better variations to your base weaponry, defense, and abilities. At the beginning of a play-through, your character shoots pea-sized bullets without much strength. 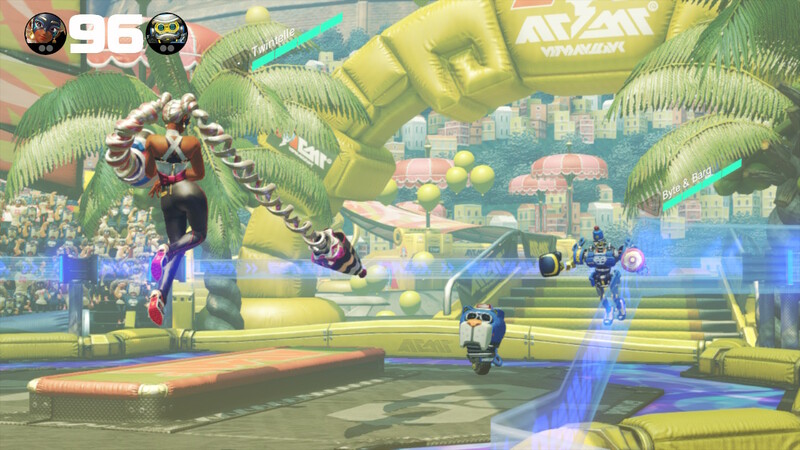 As you find and acquire new chips, you can shoot larger bullets, raise their attack power, raise your defense, make it so you don't get knocked back by attacks, learn to jump multiple times in the air as Gunvolt or dash several times in midair as Beck, and so much more. 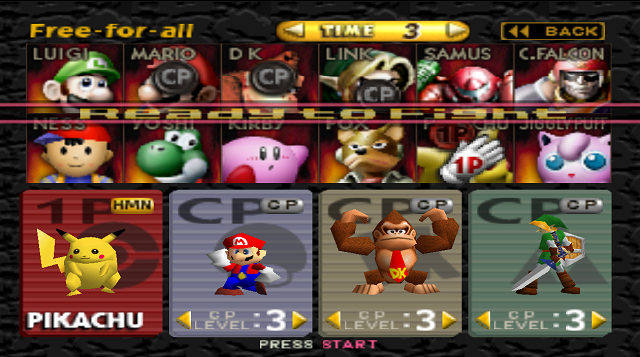 Each ability altered or equipped takes up CP, and there's a limit of what you can hold at once -- though this is helped through collecting CP chips that add to your maximum amount available. Thus, there is a good deal of strategy involved, lots of room for experimenting, and a tremendous level of customization on offer here, which can be a bit overwhelming at times. With Mighty No. 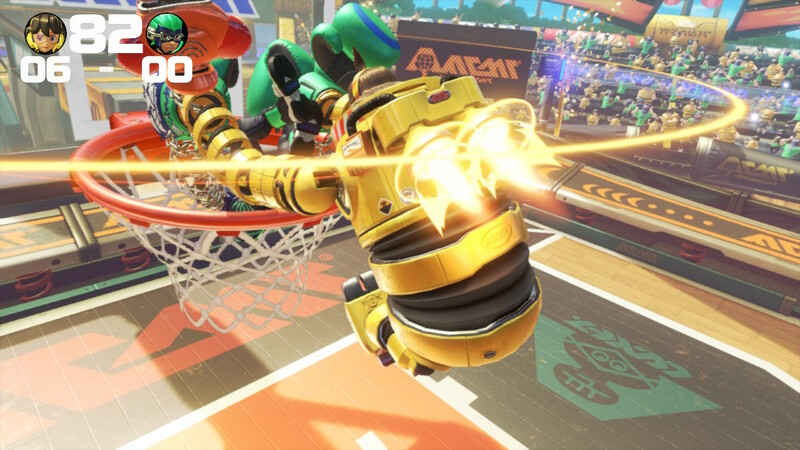 9, Beck could shoot a bunch of bullets to bring a foe's guard down before dashing into them to take them down and score points. 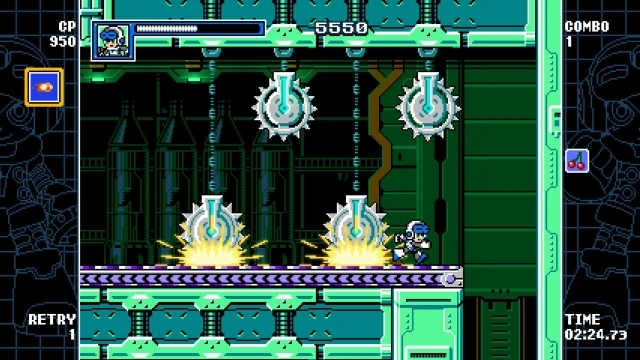 In Mighty Gunvolt Burst, the mechanic to stylishly defeat enemies is different. Instead, you need to be in close proximity to a foe when defeating them to earn a Burst bonus that awards extra points and improves your score. 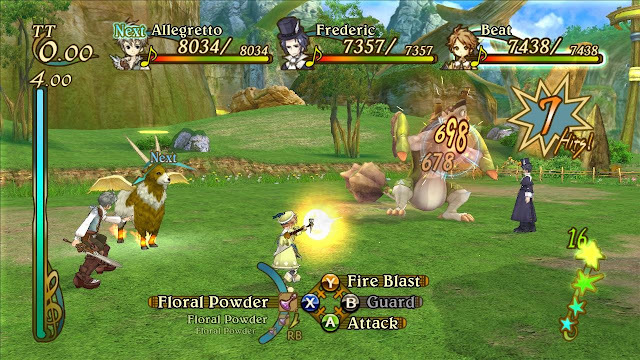 Through earning a continued combo of Bursts by defeating enemies without being too far away from them, your score increases to high amounts. 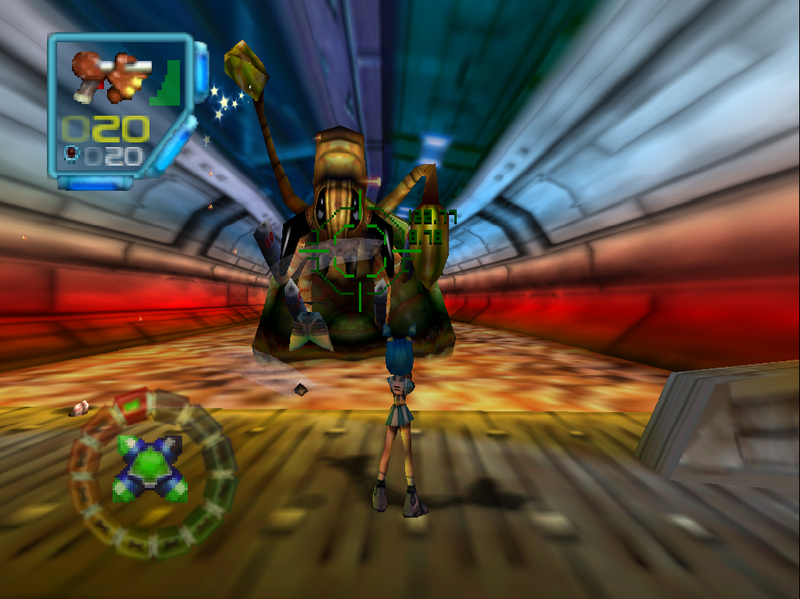 Unfortunately, this mechanic is at direct odds with Beck and Gunvolt's method of long-range attacks and shots. It makes the whole Burst mechanic seem like a last minute addition or at least one that wasn't put under rigorous testing enough to make sure it fit the game. A combo of 26!? You're just showing off now, Beck. The story of Mighty Gunvolt Burst sees both Beck and Gunvolt trapped within a virtual reality world. While it may be a false reality, so to speak, the danger to them is very real. At first the two are completely apart from one another, and eventually they meet up in unfriendly terms. 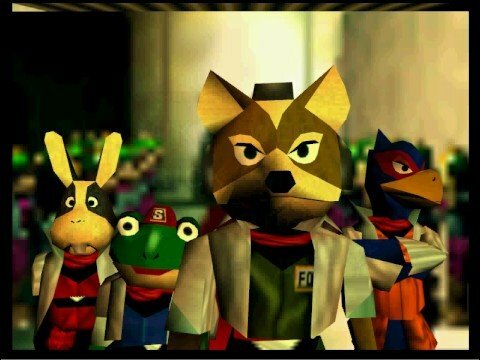 You can probably guess what happens by the end of the game (spoiler: they decide to be friends and team up against the big bad), but it's sufficient enough of a story all the same. Mighty No. 9 suffered from too much story bloat when I just wanted to get into the game. Mighty Gunvolt Burst alleviates that problem while still presenting a capable story reason to battle through the game's stages. 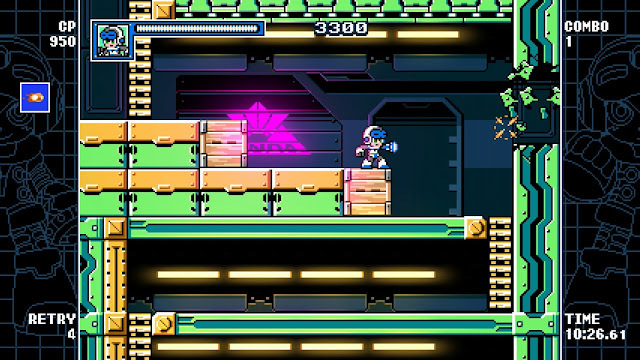 Mighty Gunvolt Burst is modern retro with hints of NES styling but more leaning towards SNES goodness regarding what the game actually does with its visuals. 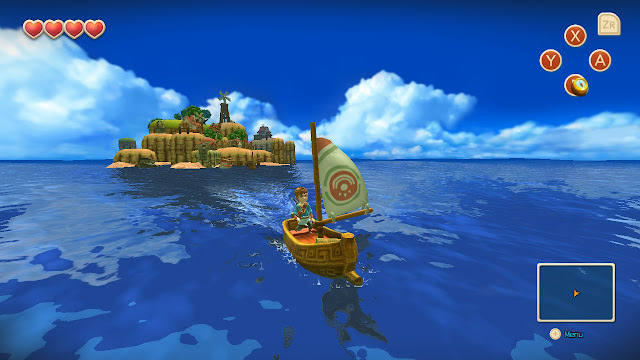 They're vibrant, colorful, seldom dull, and feature a notable amount of environmental detail for a game modeled after the classics. The music features chiptune variations of themes from Mighty No. 9, though that game wasn't well known by me for its musical qualities outside of the boss theme, which is represented in Mighty Gunvolt Burst. Overall, I was pleased with what I saw and heard out of Mighty Gunvolt Burst, and was also ecstatic not to encounter significant episodes of waning frame-rate. Add some glasses to these hazards and they're see-saws! We're traveling towards the end of June with four upcoming reviews. Here's the first, a Nintendo Switch (the version this review is based on) and PlayStation 4 game. It combines two terrific puzzle games into one sensational package. It's Puyo Puyo Tetris, and here is the SuperPhillip Central review. Someone got some Puyo Puyo in my Tetris! And it's dee~licious! Like interesting combinations and inventions over man's time on this great green earth, there have been fantastic ones like peanut butter and chocolate, Oreos and ice cream, and so forth. Likewise, there are also less enticing ones (a popular pick in the current culinary climate is pineapples and pizza). In any case, Puyo Puyo Tetris fits in the former category, a tremendous combination of two puzzle game titans (well, Puyo Puyo less so, of course) that brings a lot of fun and content to both the Nintendo Switch and PlayStation 4. 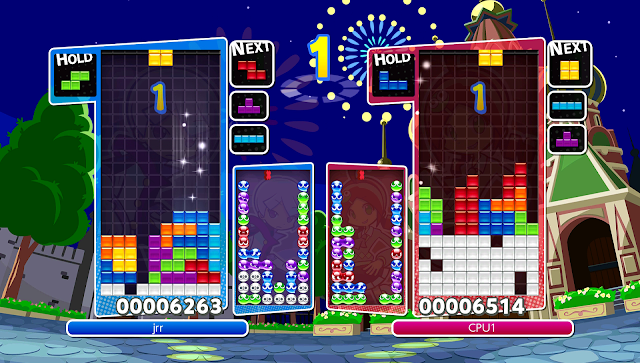 Addictive is an apt adjective to describe the gameplay of both Puyo Puyo and Tetris. 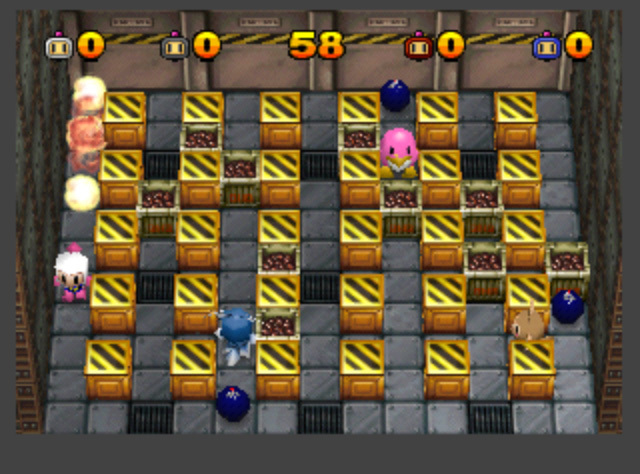 With Puyo Puyo, you have colored blobs (the Puyo) that fall from the top of the screen to the bottom in pairs. To score points, you need to have four of the same colored, adjacent Puyo match to clear them from the board. This is the most simplest form of Puyo Puyo, however, as the strategy, complexity, and depth of the game changes by needing to create chains, where popped Puyo clear the way for already laid Puyo to fall down like a waterfall, scoring more points once they fall onto resting matching Puyo. Meanwhile, Tetris is more well known as a puzzle series, where the goal is to take the falling Tetriminos (again, falling from the top of the screen to the bottom), move them around, and place them at the bottom of the screen. Your score points by clearing lines -- having one or more horizontal lines completely full of Tetrimino blocks. High points come from clearing more lines at once (achieving that awesome Tetris of five lines at once) and scoring combos. 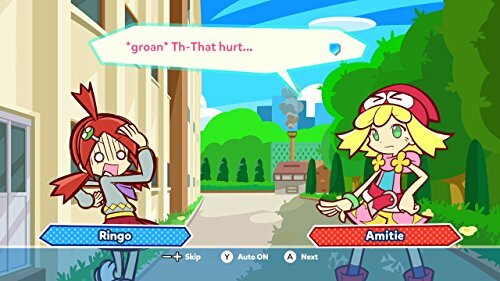 If you grow weary of one mode in Puyo Puyo Tetris, there are plenty more where that one came from. 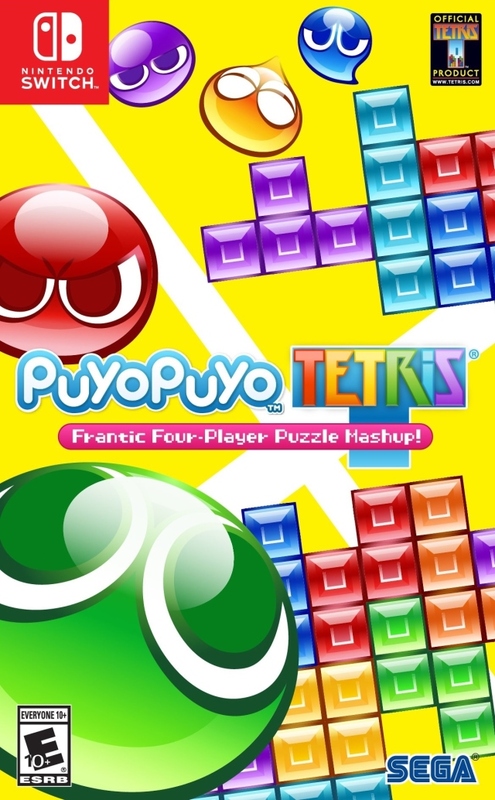 Puyo Puyo Tetris will certainly put your skills of both game modes to the test, and if you are a complete beginner (to the point where I was pretty much), there are many beneficial in-game lessons and beginner modes to get a taste of both Puyo Puyo and Tetris. 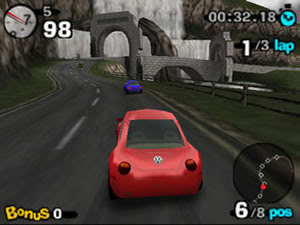 The myriad of modes shows a game seriously loaded with content, whether it's alone, with friends locally, or against players worldwide. Between the half-dozen unique Challenge modes, quick-to-play / tough-to-master Arcade modes, and Adventure Mode, you will be getting a massive amount of value with your gaming dollars. 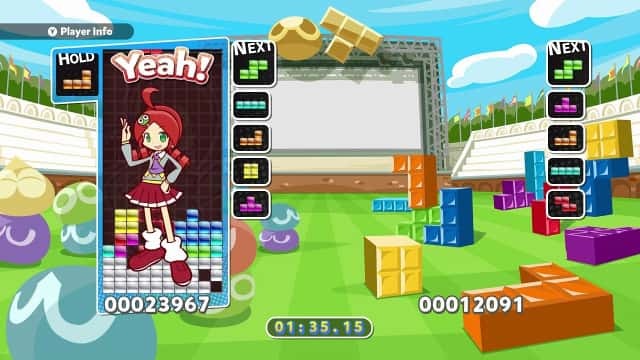 For any puzzle party game worth its weight in falling garbage blocks, a competent Versus mode is a must, and thankfully, Puyo Puyo Tetris has it, and in spades. When playing casually or competitively with friends and family and in many modes against the computer, a player can choose what ever puzzle mode they prefer, whether Puyo Puyo or Tetris. 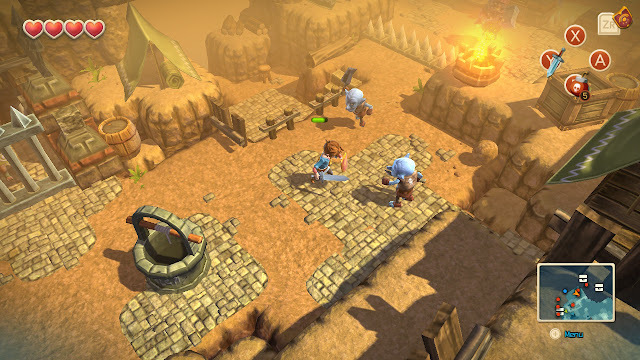 Thus, two players can be engaged in totally different puzzle modes while competing against one another. For Puyo Puyo players, a simple two-chain combo will send a slew of garbage blocks that get in the way of their progress. Meanwhile, Tetris players need to organize a multi-line clear or set of combos to drop garbage on their opponent. As you can probably guess, one is definitely easier to do than the other, and much quicker. And I'm not feeling any sympathy for the Puyo Puyo player, if that helps you guess any. 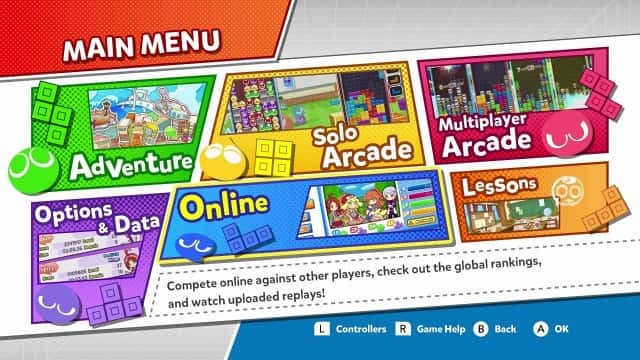 The Adventure mode in Puyo Puyo Tetris was my go-to mode for single player action. The story revolves around the universes of Puyo Puyo, featuring a wacky cast of high school anime characters, and Tetris, made up of a starship crew that is on the more serious side (though about as serious as a game with a cute sense of humor allows). Puyo Puyo blobs and Tetriminos are appearing in both universes with no apparent cause, so the two groups form a unity to get to the root of the problem. 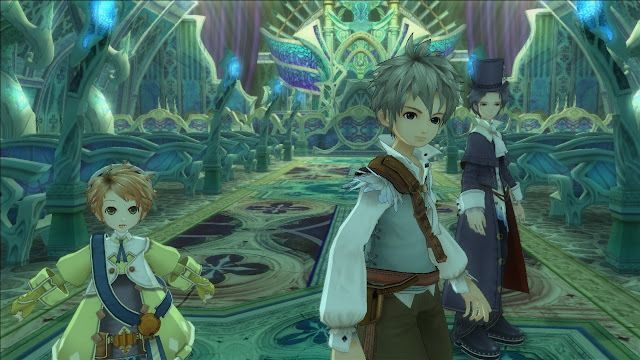 A whole slew of colorful characters appear in the Adventure mode of the game, 24 in all (which all become playable in every mode), and through the mode's ten or chapters (two of which were DLC in the original Japanese release), the story is presented through full body character stills in all their cartoony glory with fully English voiced dialogue. Zany, insane, and brilliant, this is Puyo Puyo Tetris' Adventure mode. 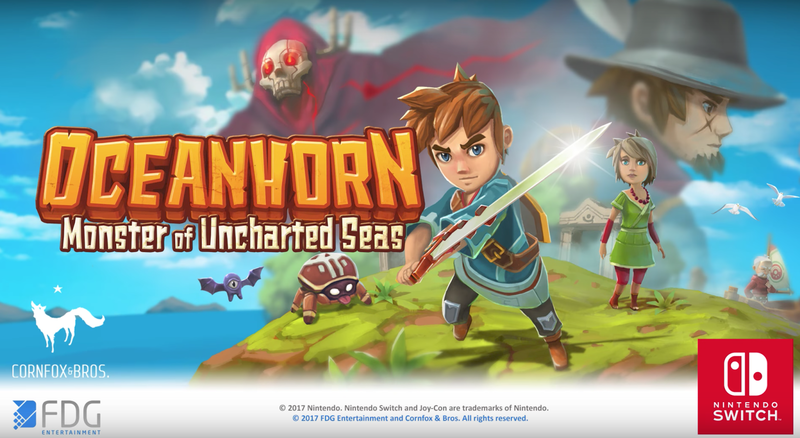 Each of the Adventure mode's chapters consists of ten levels, and they vary things up nicely so you're not doing the same types of modes or going for the same goals over and over again. It's true that you'll be doing a ton of Versus matches, yes, but sometimes you and your opponent are playing Puyo Puyo, or one is playing Tetris while the other plays Puyo Puyo. Outside of Versus content in Adventure mode, there are trials like trying to reach a certain number of points or reach a line clear threshold before time runs out. In addition to just completing the levels, you can earn up to three stars on each, with goals ranging from beating your opponent in a number of minutes to reaching a specific number of points. 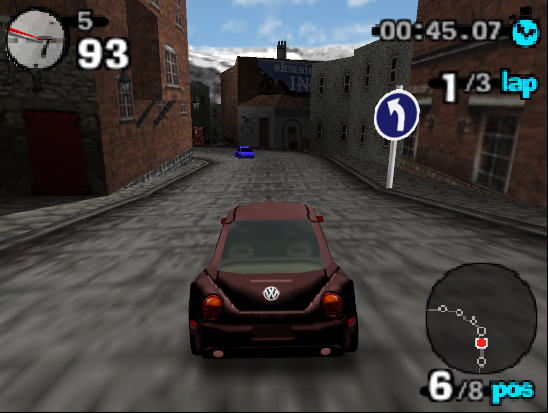 But did I complete the stage quickly enough?! One thing I especially liked about Adventure is how that if you find yourself reaching a dead end -- that is, a level that you just can't seem to complete no matter how many times you try -- there is an option to skip that level and move on to the next. As someone whose puzzle game skills of Puyo Puyo and Tetris' type leaves a lot more to be welcomed than anything else, this optional choice was a gift from the puzzle game gods. ...Or Sega. Which ever you prefer. Of course, it was totally a last resort and used sparingly. Totally. 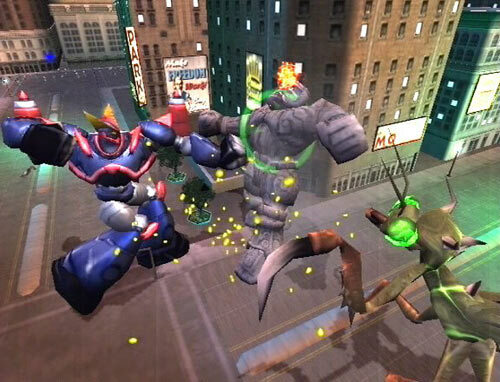 and appearances of Puyo and Tetriminos in this game. Regarding other modes, I feel Swap is one that works well. 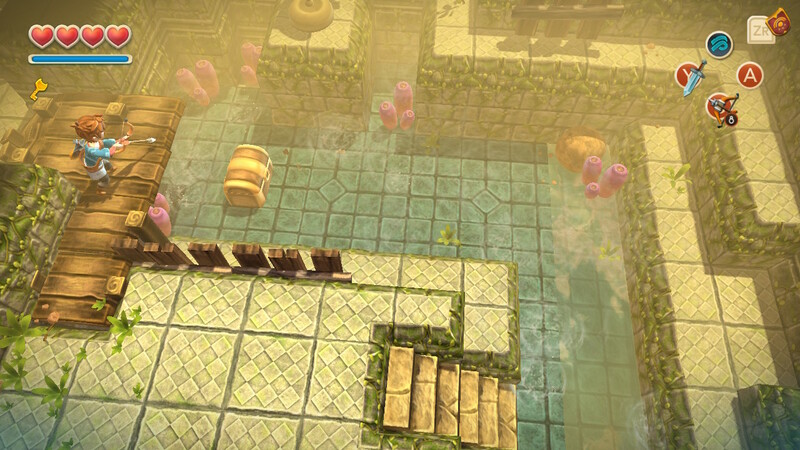 It has two different boards, each with one puzzle style on it, that opponents play on. After time ticks down enough, the boards switch, so if you were playing on a Puyo Puyo board, now you're playing on a Tetris one. The strategy here is when to time clearing lines or chains to drop garbage blocks on your opponent. Not just when it's most opportune like an ordinary Versus match, but on which board of theirs? Meanwhile, Fusion is true to its name, but a mixed bag. It certainly is a mode that has the highest learning curve to me, and for that reason, it might not be everyone's cup of Puyo Puyo tea. Here, falling pieces alternate from Puyos to Tetriminos and back again, Tetrimino pieces that no more than touch anything stay in place, and it makes for a tough time when a board is stacked high with little room to work with. Though garbage blocks are crushed underneath the weight of any falling Tetrimino, crushed Puyo Puyo fall from the top of the screen. 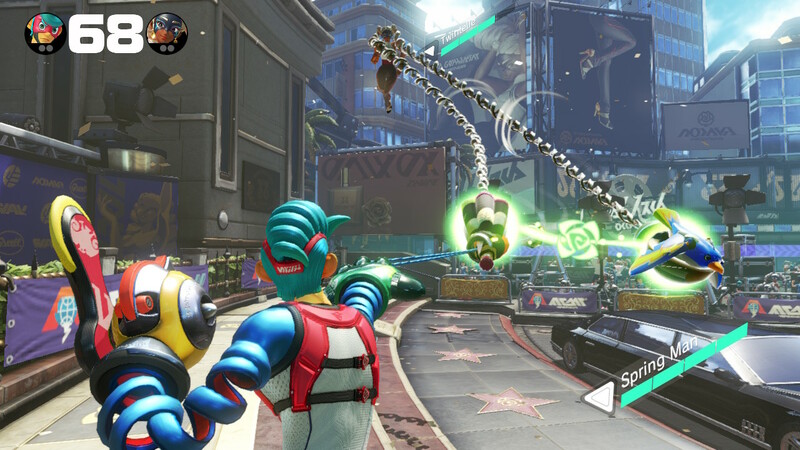 If you've the rules of Tetris and Puyo Puyo hardwired in your brain, you're going to need to do some reconnecting to get a grasp on Fusion mode. Fusion mode might go over your head the first few matches, but eventually it may click. 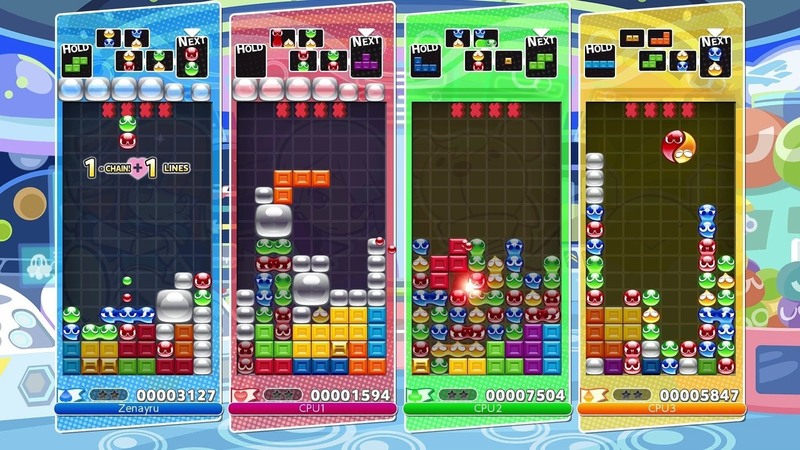 Puyo Puyo Tetris is a robust, mode-rich puzzle game perfect for quick burst plays or extended sessions in the single player modes, specifically the wacky, endearing, and delightful Adventure mode. Whether you're a Puyo Puyo fan, Tetris lover, beginner, veteran, never played a Tetris or Puyo Puyo game in your life, or played at tournaments, Puyo Puyo Tetris has something for everyone. Puyo Puyo and Tetris are a winning combination.